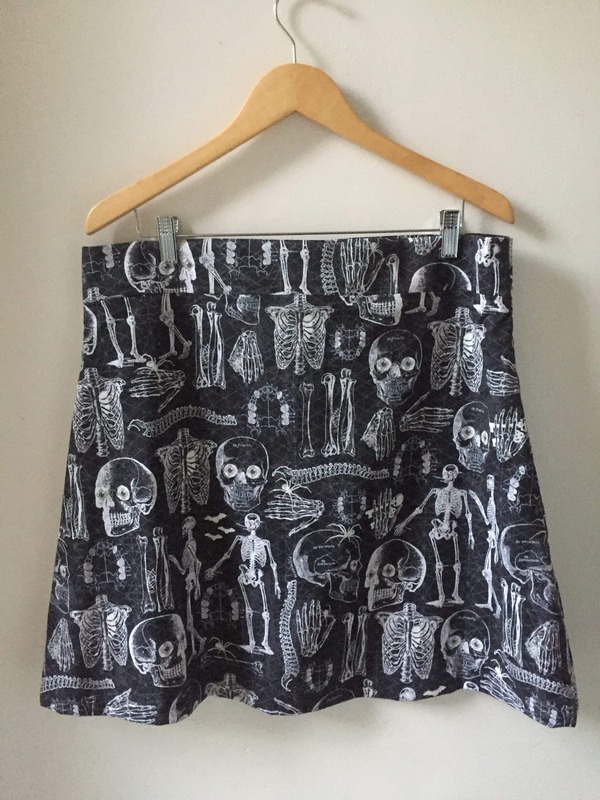 The first garment I have ever sewn was a skirt. It was made out of a hideous fabric, in the wrong size, and without any finished seams. It was a disaster. But it was also very satisfying that I had made something, and it gave me the confidence that I needed to embrace sewing. 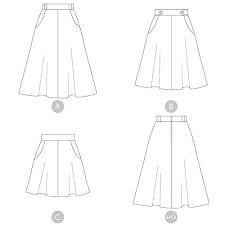 Since then, I have made many more skirts—some successful, some terrible, but with every one of them, I have strengthened my skills and become a better sewist. I love the flexibility that skirts provide. Is it summer? Wear them with sandals (not that I own any) or a cute heel. Is it winter? Rock them with some tights and a pair of boots. Dress it up with a nice blouse, or dress it down with a cute T-shirt. Did you gain or lose weight? Skirts can be quite forgiving. I have gained and lost and gained and lost weight, and I wear the same skirts no matter which way my weight fluctuates. But what I love the most about skirts is that they are not pants. Pants are evil. They squeeze the life out of me. Skirts don’t try to strangle my crotch. They let everything breathe. Thank you, skirt. You are my best friend. I have experimented with many patterns, but there are a few that have really withstood the test of time and body weight fluctuations. My three favorite are the Delphine (Tilly and the Buttons), the Hollyburn (Sewaholic), and the Ginger (Colette). I have had to make changes to some of the patterns, but they are all easy to sew and wear. The Delphine is my favorite of the three. I have more Delphines in my closet than I can count. 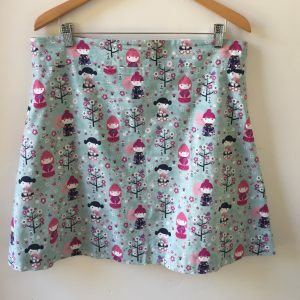 It is very easy to sew and a great choice to highlight a beautiful print since there is no front seam. With less than a yard and a half of fabric (60-inch wide), I can make a size 6-7. I had to make some changes to the pattern since the original design is too short and round around the hips. I added length and made the side seams straighter. 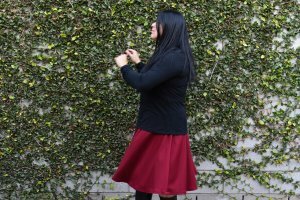 The yoke is wide enough to provide my stomach with some support, and the skirt panels make a really nice A-silhouette that I like to exaggerate with a sturdier fabric. 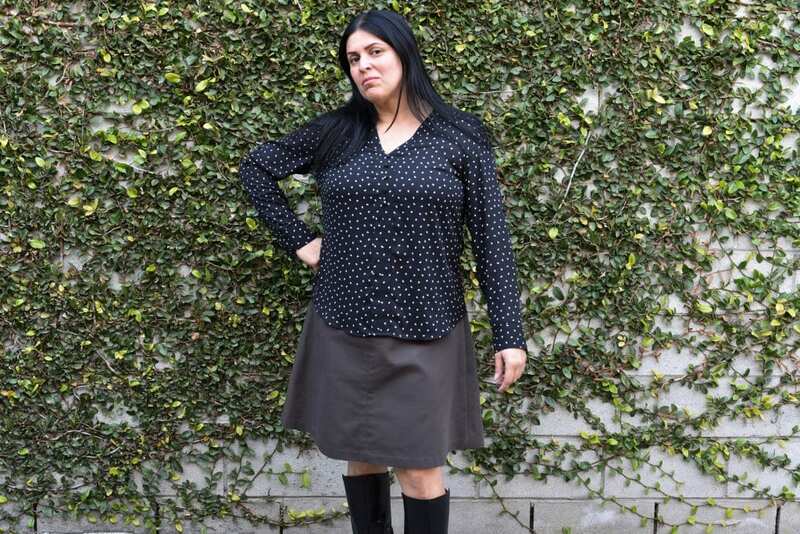 The Hollyburn is a great pattern for those who love a fuller skirt. Because it is cut on the bias, the skirt drapes beautifully, and depending on the fabric, you can get a lot of movement. Because it is cut on the bias, it takes a lot more fabric than the Delphine. It allows for a great Chevron effect when made out of a striped fabric, but it might not be the ideal choice for certain prints. I am not crazy about waistbands as they are not wide enough to tame my protruding belly, but the one in the Hollyburn seems to work well for me. 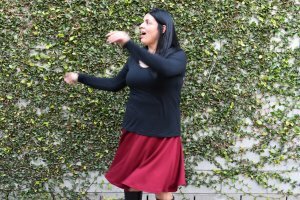 My most successful fabric choice has been ponte knit—it is heavy enough that I do not need to line the skirt, but it has amazing drape, which makes for a nice, full, twirly garment. The Ginger is the latest addition to my list of favorites even though this pattern has been around for the longest time. 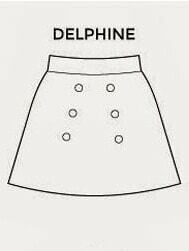 It is very similar to the Delphine with one important difference: the skirt front is made up of two pattern pieces. This allows for two variations, one cut on the grain, and one cut on the bias. The waistband is wide enough that it feels more like a yoke. My most favorite feature of the Ginger is the pointed center waist (version B was a curved waistband, but I have not tried it yet). This detail will not be known to anyone else as I never wear tucked-in blouses, but it makes me so happy that it is there. I used heavier cotton fabric to sew both my Gingers, and they are right on the verge of being too A-line, so I would keep an eye on the drape of the fabric. The Delphine is an excellent option if you want to expand your work closet. It is a quick and economic make as it is easy to sew, and it does not take a lot of fabric. 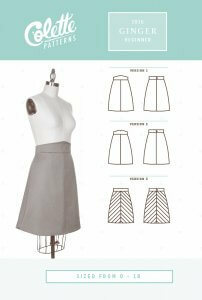 It is an amazing pattern for beginners and experienced sewists alike. 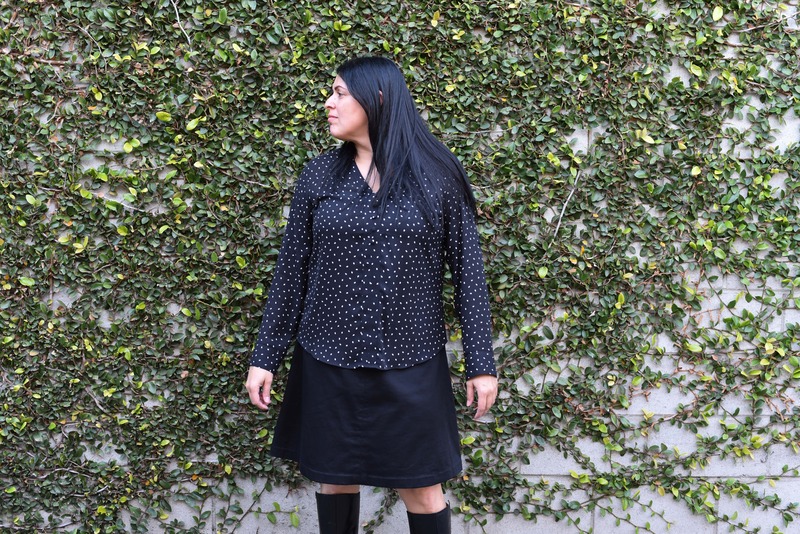 I find its shape incredibly flattering on me—I do not have much of a waist or hips, so the A-line silhouette gives my body some balance by accentuating my lower half. The Delphine can be as sober or extravagant as you please; it all depends on your choice of fabric. Cotton prints work really well with this pattern, but any fabric with a bit of weight to it makes a beautiful Delphine. When I first saw the line drawing for the Hollyburn, I was afraid that all the fullness would not work with the tops I usually wear (a drawer full of Plantains! ), but it works really well with almost everything I have. The Hollyburn is the perfect choice for a fancier skirt. A light wool blend can give the longer versions of the Hollyburn a sophisticated touch, while the short version in some rayon will make you want to hit the dance floor to get the full effect of all the swishness. There is enough room in my heart to house all three amazing patterns. I want to explore the possibilities of the Ginger skirt as I plan a satin or velvet version to be worn with one my corsets. 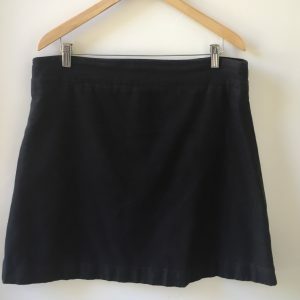 I have many Delphines lined up—one of them with the same black fabric that I used for my goth Ginger… because one can never have too many black skirts! And I have just found a tweed ponte from Joann that will make the most perfect winter Hollyburn for the non-existent cold weather in Los Angeles. I prefer skirts. 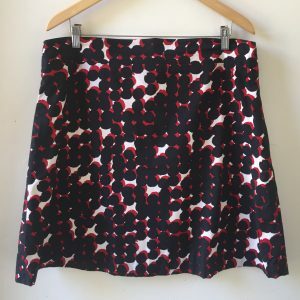 One of my favourite patterns is called the flouncy bouncy skirt , a half circle . 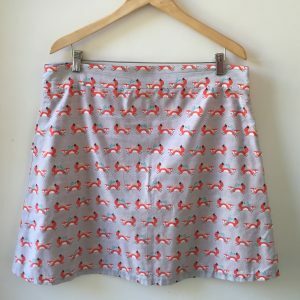 Skirt with a yoke . I am going to look it up. Thanks!